In this window, the first thing that needs to be done is to enter a name for a linked server in the Linked server box and to choose the server type by clicking the SQL Server or Other data source radio button under the General tab. More about the Security and Server Options tab can be found on the How to create and configure a linked server in SQL Server Management Studio article. This error occurs because Azure does not allow to alter the master database. To resolve this, you need to connect directly to the Azure database you are going to use. This time, under the Server type section of the General tab, choose the Other data source radio button. The name for the linked server in the Linked server text box can be, this time, whatever you like (e.g. AZURE SQL DATABASE). Under the Provider drop down box, choose the Microsoft OLE DB Provider SQL Server item. In the Data source text box, enter the name of the SQL Azure (e.g. server.database.windows.net). The most important setting in order to correctly create a linked server to an Azure SQL database is to enter the name in the Catalog text box (e.g. 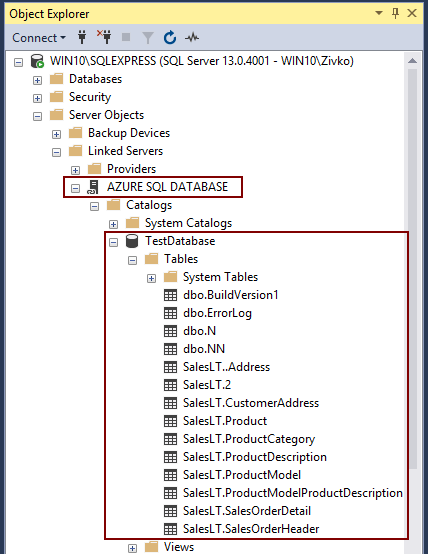 TestDatabase) of an Azure SQL database for which you want to create a linked server to an Azure SQL database. Otherwise, if this field is left empty, we will encounter the same 40515 error when trying to get a list of the tables under the Catalogs folder. Server ‘AZURE SQL DATABASE’ is not configured for RPC. This is because the RPC and RCP Out (Remote Procedure Call) options that allow remote procedures to be called from the linked server or to be called to the linked server by default set to false. The results will be the same as from the example above. This is the ad hoc method for connection to a remote server using the linked server and querying data from a remote server. If the connection to remote server is frequently used, then using the linked server is better solution instead of using the OPENQUERY function. This function can be used in the FROM clause of the INSERT, SELECT, DELETE or UPDATE statement. To connect to Azure SQL database and access data without creating a linked server first, use the T-SQL OPENROWSET or OPENDATASOURCE functions. Another way of connecting and querying data from the Azure SQL database is by using the OPENDATASOURCE function.